Chinese manufacturer OnePlus is all set to launch another special variant of the OnePlus 5T on January 5, with the company teasing the launch on that date. The company is expected to bring back the Sandstone variant that was first seen on the OnePlus One. This new variant comes a few weeks after the OnePlus 5T Star Wars edition had been launched with a similar white textured back panel. 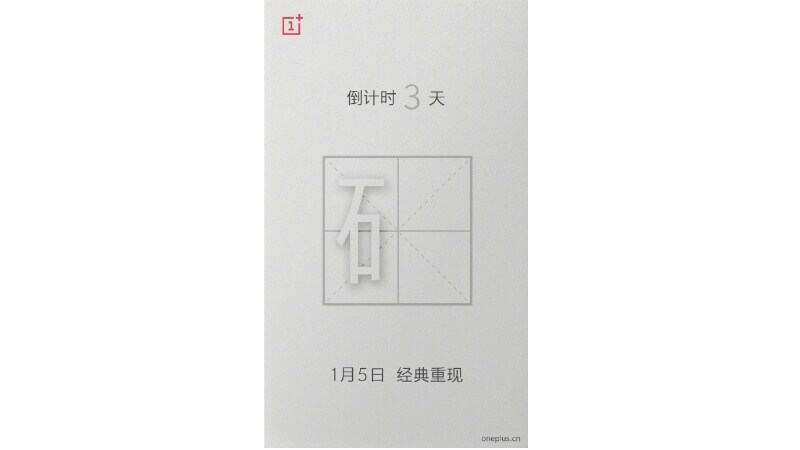 OnePlus in an official post on Weibo hints that the OnePlus 5T is getting a new Sandstone finish variant that will be launched in China on January 5. There is currently no update on the colour of the variant’s back panel. The company recently hinted at the new model through a video uploaded online. An invite has also been sent out that has phrases like ‘three days left’ and ‘The Classic returns’ on it. The Chinese company had celebrated four years of the Sandstone Black OnePlus One last month. The Sandstone Black colour variant had been part of the OnePlus clan till the OnePlus 2. The OnePlus 3replaced it for a metal finish. To recap, the OnePlus 5T (Review) is a dual-SIM smartphone. It features a 6-inch full-HD+ Optic AMOLED display with an 18:9 aspect ratio. The phone is powered by a Qualcomm Snapdragon 835 SoC and comes with 6GB/ 8GB RAM variants.